To start of my birthday celebrations, on Thursday evening I had dinner and drinks at The May Fair in London with my best friend Kate, and these photos were taken last night when I went out for a family meal (where my well-meaning father had sneakily arranged for the entire restaurant to serenade me with 'Happy Birthday' - cringe is not a strong enough word.) Today, I've been shopping in London with my mother and as I've scheduled this to go up at 6pm, will currently be indulging in my annual never-ceasing tradition of 'party tea'. I am not ashamed to say that by 'party tea' I literally mean children's party food. Loving life. Jacket : ZARA. Shirt : ASOS. Trousers & Shoes 'STUNNER' : Topshop. Necklace : Etsy. Earrings & Bag : Chanel. Happy Birthday Arabella. I hope you've had a wonderful day. Happy birthday! I love the shoes! Hope you have an amazing birthday weekend! The colour of the blazer is gorgeous and suits you so well. Oh Arabella, you showed so many treasures here so I just can't <3 I love every lil detail <3 :) You are amazing. happy birthday you pretty little thing you! you look bloomin' stunning as always! Happy Birthday you beautiful girl! Sounds like you had an amazing day. Happy belated b-day! Stay chic! Happy birthday, hope you had a lovely day! 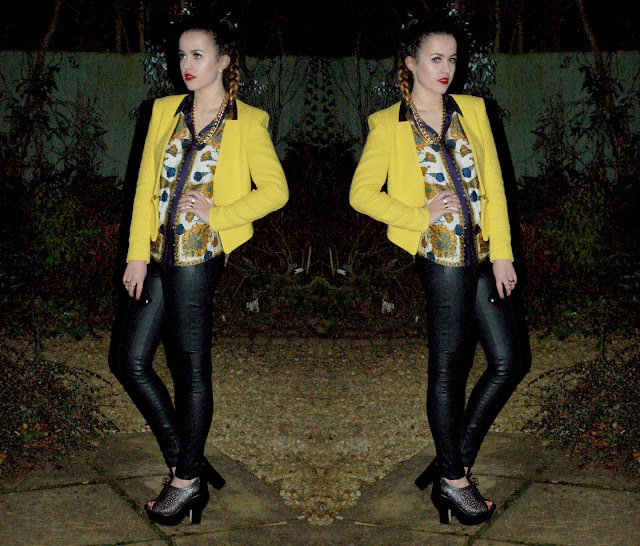 This yellow blazer is amazing! We also have family 'party tea' for every single birthday. It's great. Happy birthday - have an amazing 21st! Love your shoes, and the yellow looks so great on you! Absolutely love each and every piece! it, constantly, by making it digitally interactive?